A paper published today in Global and Planetary Change finds another non-hockey-stick in the Russian sub-Arctic with reconstructed temperatures showing a cooling trend over the past 4,500 years since the Holocene Climate Optimum. The paper adds to over 1,000 other worldwide non-hockey-sticks published in the scientific literature. Especially in combination with other proxies, the oxygen isotope composition of diatom silica (δ18Odiatom) from lake sediments is useful for interpreting past climate conditions. 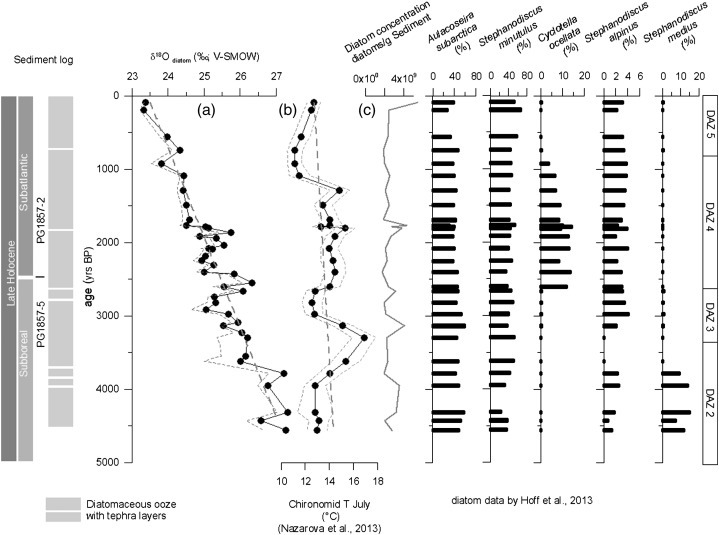 This paper presents the first oxygen isotope data of fossil diatoms from Kamchatka, Russia, derived from sediment cores from Two-Yurts Lake (TYL). For reconstructing late Holocene climate change, palaeolimnological investigations also included diatom, pollen and chironomid analysis. The most recent diatom sample (δ18Odiatom = + 23.3‰) corresponds well with the present day isotopic composition of the TYL water (mean δ18O = -14.8‰) displaying a reasonable isotope fractionation in the system silica-water. Nonetheless, the TYL δ18Odiatom record is mainly controlled by changes in the isotopic composition of the lake water. TYL is considered as a dynamic system triggered by differential environmental changes closely linked with lake-internal hydrological factors. The diatom silica isotope record displays large variations in δ18Odiatom from + 27.3‰ to + 23.3‰ from about ~ 4.5 kyrs BP until today. 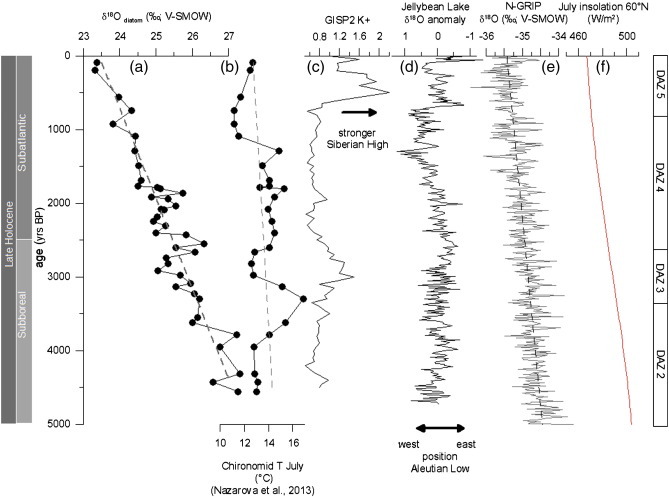 A continuous depletion in δ18Odiatom of 4.0‰ is observed in the past 4.5 kyrs, which is good accordance with other hemispheric environmental changes (i.e. a summer insolation-driven Mid- to Late Holocene cooling). The overall cooling trend is superimposed by regional hydrological and atmospheric-oceanic changes. These are related to the interplay between Siberian High and Aleutian Low as well as to the ice dynamics in the Sea of Okhotsk. Additionally, combined δ18Odiatom and chironomid interpretations provide new information on changes related to meltwater input to lakes. Hence, this diatom isotope study provides further insight into hydrology and climate dynamics of this remote, rarely investigated area.